BRITISH COLUMBIA – Garibaldi Resources of Vancouver says its geologists believe the E&L mineralization will prove to be a large tonnage, high grade intrusion defined over a length of 4 km and a width of 1.5 km. 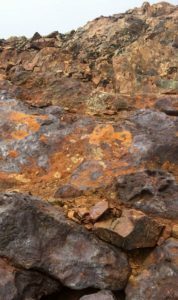 This is the first magmatic nickel-copper-rich massive sulphide system in the prolific Eskay mining camp. Part of the massive sulphide outcrop at the E&L intrusion in the Eskay mining camp. After compilation and interpretation of historic and current data, including 3-D modeling, Garibaldi says the E&L intrusion may host more than one such deposit. A heli-borne electromagnetic survey is to be carried out as soon as weather permits. A major 2017 drill program is also planned.